E S S A Y There’s this sense that millennials and baby boomers are at odds with each other, but I’m not sure how real that is. Are baby boomers really standing in the way of millennials? In the workplace we may be hanging on to our jobs but millennials seem to be doing quite well when it comes to taking the reins in management positions and it’s hard to ignore their growing dominance in the worker hierarchy. When it comes to seeking shelter, however, millennials and boomers are competing for the same kind of housing for vastly different reasons. And the situation is exacerbated by the historically low housing inventory that is typical throughout the country right now. Until the residential construction industry ramps up the inventory of 2,000 square foot and under homes, millennials and baby boomers will be jousting for the same properties. 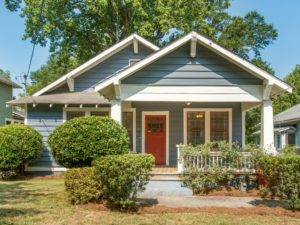 Millennials are looking for 1,800 square foot starter homes and baby boomers are looking for 1,950 square foot downsized homes, so essentially they want the same house. Millennials seek affordability while boomers want a more compact lifestyle. Millennials make up 42% of all homebuyers and the median age millennial (33 years old) makes up 56% of this country’s first-time homebuyers. They may dominate the market by their sheer numbers, but the baby boomer has the cash from the sale of their large home, so they can often bid up the price beyond the millennial’s budget. Out of frustration with this imbalance, millennials are either deciding to rent or looking at larger, less affordable homes where they won’t be in competition with boomers. If they are thinking of starting a family, the larger home also eliminates the need to trade up after 5 years in the starter home. If this competition for housing seems disturbing to anyone, particularly baby boomers, let’s not forget that millennials younger than the median age of 33 are still quite likely to still be living under their parents roof because they cannot yet afford even to rent their own place. When you look at it that way, some baby boomers are just as locked out of the smaller house market as their offspring. So who is house blocking who?